An American Territory, and an independent country, their culture and backgrounds are similar - friendly people, exciting singing and dancing made this one of our most pleasant stopovers. We anchored in Pago Pago harbor 9 days from Bora Bora, amid the odor of the tuna factory. Traditionally put down as a dirty, unattractive destination - we loved it! The people were as friendly as could be. Dragon boat races as seen above livened up the harbor! Mail service from the US was quick and cheap, restaurants were reasonable, and tours to the north and eastern shores were beautiful. One downside was the rain - sometimes we had to bail the dinghy twice a day to avoid swamping it. 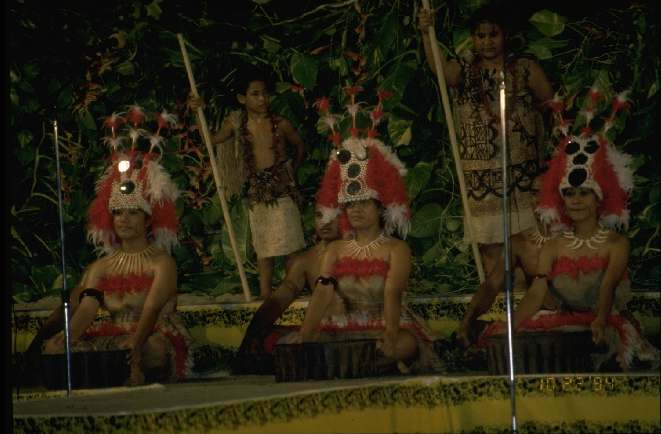 The mini-Heva festival held in October has wonderful Samoan singing and dancing plus a re-enactment of a Kava ceremony. Previously known as Western Samoa, this country has changed its name since our visit. The capital, Apia, is pretty but a little run-down. The anchorage at Apia is secure, although the dinghy landing on a set of cement steps appeared a little hazardous. Beaches on the South coast are beautiful. Traditional homes are open falles as seen to the right. 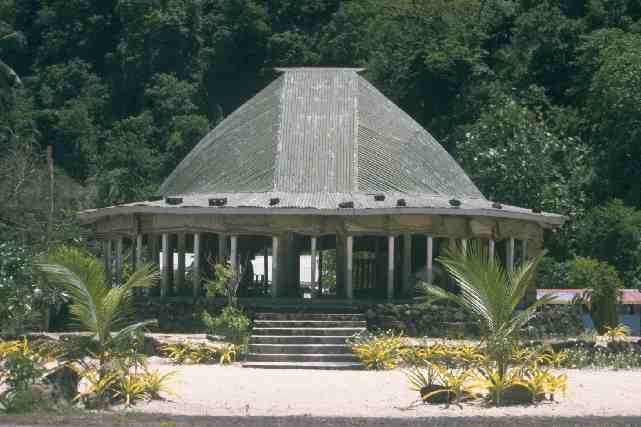 Open plan, with high roof, no fixed walls (woven mats can be used to provide privacy) - this type of structure is found across the South Pacific and known as falles, fares, bures, ... all apparently from the same origin.